Northeastern University Press, 9781555537081, 70pp. Tulips, Water, Ash begins with a kind of invocation--a calling-out from the domestic world, "the soft / chewy center of here: the mailbox, / the toaster, the dentist office . . . Whiteboard, whiteout. Little yellow / notes everywhere like moths." So many of these poems--their bus stops and taquerias, sidewalks and bathroom mirrors--give us the ordinary, the daily, but with all the lights turned on: surfaces made near-transparent by a consciousness whose shifts and asides are a pleasure to inhabit. Others dive into the mystery just underneath, colliding junior high school with theoretical cosmology, suburbia with multiple universes. There is a fascination, too, with the life of language, the names of things in these poems often as much a mystery as their simple presence. This is daily life with its underlying passions and strangeness exposed--the point at which each of us, like the speaker, "slip s] back down / through a hole in the net." 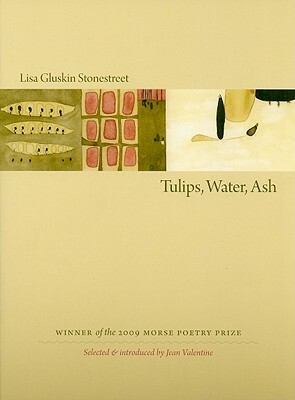 LISA GLUSKIN STONESTREET has been awarded a Javits fellowship and a Phelan Award, and her poems have appeared in journals such as Blackbird, The Iowa Review, and Michigan Quarterly Review. She lives in San Francisco with her husband and son. JEAN VALENTINE is the author of ten books of poetry, including Door in the Mountain, winner of the 2004 National Book Award.